Last summer, my husband took a job in another city for a year. This left me at home with eight kids and more responsibilities than I could handle. You might say, I had too many penguins on the iceberg. My solution was to spend less time on me. Sleep less. Eat less. Do less of what I needed to give more and be stronger for them. As you can imagine, it was only a matter of time before penguins began flinging off my iceberg. Not surprisingly, there was a price for neglecting myself. Neither is it startling to learn Scripture warns us there is a price for NOT resting. Consider God’s dealings with the Israelites as they settled into the Promised Land. In Joshua 21:43-44 we find God’s people entering His rest, experiencing all God promised them. Thus the LORD gave to Israel all the land that he swore to give to their fathers. And they took possession of it, and they settled there. And the LORD gave them rest on every side just as he had sworn to their fathers. Not one of all their enemies had withstood them, for the LORD had given all their enemies into their hands. Later the Psalmist encourages the people of his day to learn from those who were not able to enter because of their unbelief, and to choose differently. Isaiah does something similar in his day. What does all of this have to do with you and me today? Hebrews clears the fog by explaining that the promise of entering His rest still stands today (Hebrews 3:7-19). Therefore, the risk of NOT entering it also remains. There can be an UNBELIEVING HEART within a Believer that refuses to cleave to, trust in and rely on God. Can you see how this could be a present reality? We believe God for our purposes in life. But the road to our particular Promised Land is wrought with impossibilities, hardships, difficult people and dysfunctional relationships. It’s easy to lose your footing in the midst of all this malarkey. Who wouldn’t be tempted NOT to cleave, trust in, or rest upon a God who makes promises blurred by all this haze? Oh– but There is a price of NOT Resting. There are consequences for refusing to believe the God who gives rest to our souls! Constant turmoil. Anxiety and worry. Defeat. Can we agree that this price is too great? If this refusal remotely defines the state of your heart, then take the advice found in Psalms 106:6 and 25:11. Ask for forgiveness. Unbelief for the Believer is a sin. NOT resting as a Believer– not cleaving to, relying on, or trusting in Him-– is sin. Ask, and you will be forgiven. 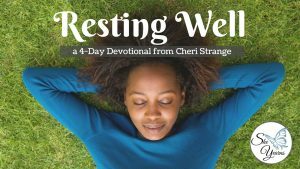 His rest is too good to miss! With Much affection, for His Glory!